My initial interaction with the City of Phoenix Center for the Arts project was in 2004 at the initial pre-proposal when the late Patty Tax, a City of Phoenix contracts administrator, was explaining the project and she emphasized that this was a very special project. 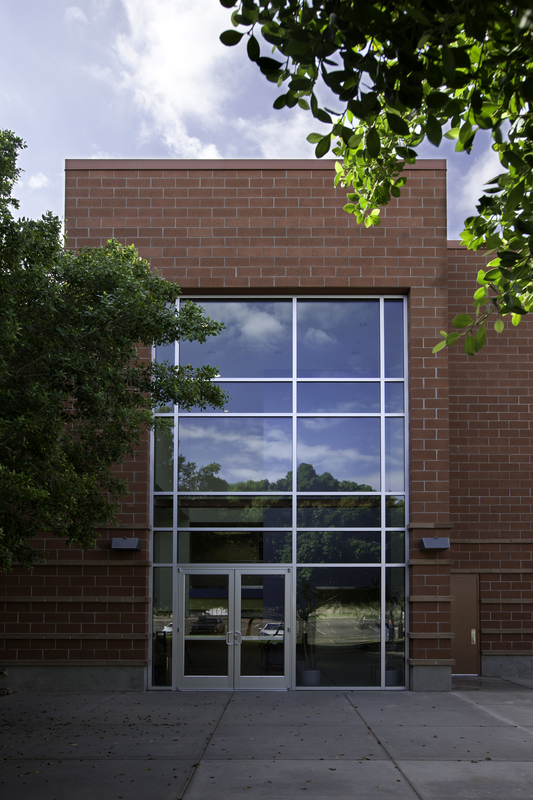 The final building addition Serbin Studio were architect of record on came to a conclusion in the Spring of 2012. Joseph Benesh’s vintage VW bus. Photo credits, Christiaan Blok Photographer, Marta is seated at the reception. Just for clarity sake you might want to keep in mind that JB: Joseph Benesh, MS: Marta Stout and LS: is yours truly, Lara Serbin. 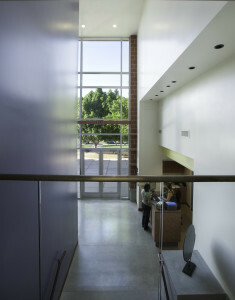 LS: What’s unique about the Center for the Arts for Down Town Phoenix? MS: A non profit organization working with a municipality like City of Phoenix. We were able to take over something that was City run. We can brag a little bit here. It is a formula that you wouldn’t think would work but it does for us. The City owns and maintains the buildings, they are helping us in that sense. We are bringing non-profit arts. Joseph really injects a lot of spontaneity. Since I started in August of 2011, I noticed that Joseph had a very clear vision of what he wanted to do. I like how we stay flexible while we are growing. We can try new things. I call it growing gracefully. We are going through growing pains yet we are 37 years old. That is due to the recent switch in management. We are a little big organization with more wiggle room. We have to be agile. JB: I don’t filter people coming to our Center until we give them a chance. It doesn’t always work out but when it does, great expansion comes from different points of view. There may be a pottery student that has the best idea about a new upcoming venue. You never know where inspiration is going to come from. 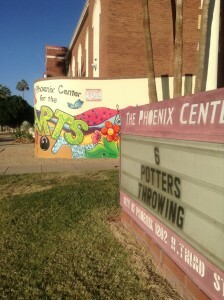 The diversity of organizations currently like Radio Phoenix.Org, Dulce Dance Company and Roosevelt Row CDC. LS: How do you see you unique in terms of your programming? MS: It is extremely varied. What I see normally is a center that is limited to dance or arts. We have variety based on information with face to face interaction with the community. We ask questions like: What do you want? 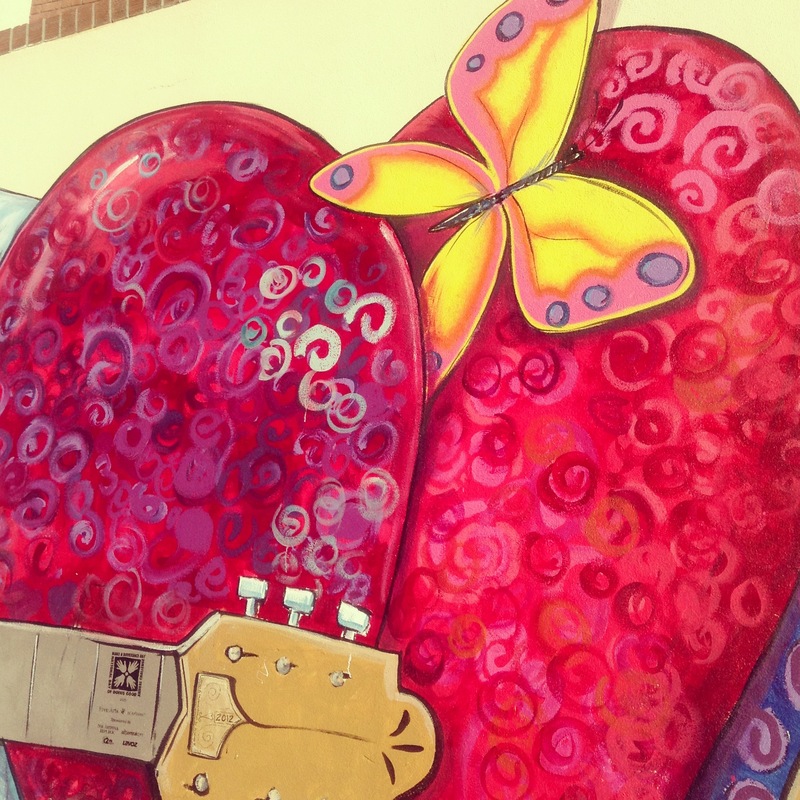 We are so close to Roosevelt Row where there are tons of active artists. People who act, paint, sing and write. We do those things here but I think it is a nice reflection of what the actual community is doing. We have the theater that we’re trying to activate even further. People are looking for places to perform that they can walk to and catch the light rail. One of the things we started is called Family Fridays, which offers open studios. We want people to know they are welcome to bring a sketch pad, have a seat and take part in the class. LS: So you are encouraging some of the parents to sit in on classes? MS: Absolutely. If people want to come in during the day and there is a class they want to see, let’s go! Let’s walk you in and see the instructor interacting with artists. We have the same students who have taken ceramics class together for 6 to 8 years. It is a mini family. We love to have new people see how much fun we have. You get sucked in. LS: That is the wonderful thing about the arts, it makes your mind more pliable by changing your focus. Do something different like bang on a set of drums. MS: Yeah, there is no pressure. It’s not like you have to come in knowing how to fill in the blank. Come in, try it, even if you think you are horrible at it. Your going to make the happiest mistake of your life by trying to paint a tree. I think of it as a child like experimentation. Kids aren’t afraid to try something. We give that chance to adults. Kind of loosens you up a little bit. LS: How have you seen this transformation impact the community around you? 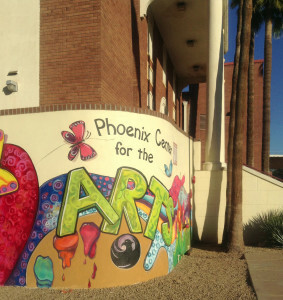 Arizona Free Arts Mural, painted by 180-200 volunteer artists in 2012. MS: Well it is new! I explain when and why the addition happened. There is a visibility to it now. People feel welcome especially after the addition of North Entrance and Arizona Free Arts came on Make a Difference Day and painted the mural. They had so much fun doing it. It is nice to see a city taking ownership of what is here. It’s not a matter of “”Let’s just knock everything down to the ground and start over.” We have a gem of an opportunity sitting right here. It started with Joseph Benesh , City of Phoenix, Brycon Construction and Serbin Studio working together. I came in just before the construction took off. LS: What makes you particularly proud of the Center for the Arts? MS: It’s user friendly. My background is theater and one of the things you end up studying is how you can make this approachable. The fine arts is elitist. We are not. Center for the Arts is accessible and affordable. It is huge that we are now ADA compliant. Being able to take a student into a gallery who before the addition couldn’t access the second floor. Now everyone can flow easily to the metal studio, photography studio or theater. 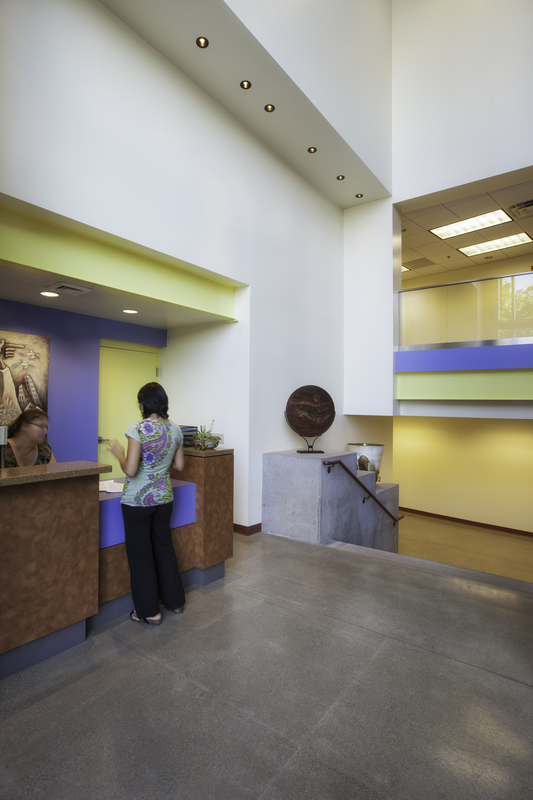 We are part of the new downtown Phoenix revitalization. I have always been a process type rather than a product minded person. It is a really neat process to be involved in. It has changed so much since I first got here! Now it’s like, “Why are all these cars here?” and I will say, “That’s because we have classes, or a performance going on.” It is a nice problem to have when students are complaining about parking on a Saturday night! LS: What is the next chapter in the Center for the Arts story? MS: A solid core of programming where people know us for ceramics, metals and painting programs. Expand what programming we offer based on community feed back. 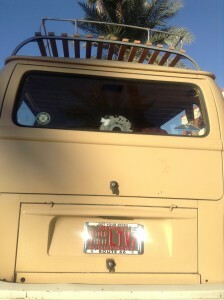 I have been meeting with desert weavers and spinners guild. They are interested in a fibers program. Fiber artists want to come in, rent a loom and knock out some projects. In just a year we’ve grown from 2 staff members to 5. We have already met 30% of our projections for Spring classes. We grew over 93% from last year in terms of people enrolling and staying. Now we can nail down how we handle developing a program and what we put in here based on the feedback we are getting. Nowhere but up! JB: In the past I never liked to take credit for my accomplishments, it was always the success of a team. The success we are experiencing now I can see as a result of all my past theater experience of asking questions. When I was programming shows for theater seasons I would have to book the shows way out in advance, always forward thinking. This post is dedicated to the late Patty Tax, City of Phoenix, Contracts Administrator. Special thanks to Joseph Benesh and Marta Stout!